The Real Estate Authority is the independent government agency that regulates the New Zealand real estate industry. Their job is to promote a high standard of service and professionalism in the real estate industry and help protect buyers and sellers of property. At Nidd Realty we endeavour to gain advocates for the business during every transaction. If something ever does go wrong or even if you just want clarification on an issue, we do everything we can to deal with things as quickly and fairly as possible. 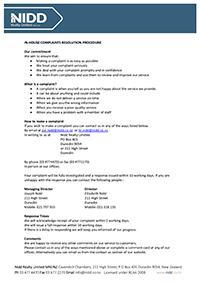 You can contact Joe Nidd on 021 797 955 or Liz Nidd on 021 328 135 to discuss things or click here to view our complaints resolution procedure. When you are buying or selling residential property you should always have a written sale and purchase agreement. This is the legal document that forms the contract between the buyer and the seller. This guide provides information about sale and purchase agreements, tells you where you can get more information, what to expect from a real estate agent1 and what to do if there is a problem. Selling your home can be a complex process and most people choose to use a real estate agent to help them. If you use an agent you will need to enter into a written agency agreement which forms the contract between you and the agent. This guide provides information about agency agreements, tells you where you can get more information, what to expect from your agent, and what to do if there is a problem.